"Crop Circles are considered to be manifestations of alien beings visiting the planet or those inhabiting our Earth unknown to our knowledge. 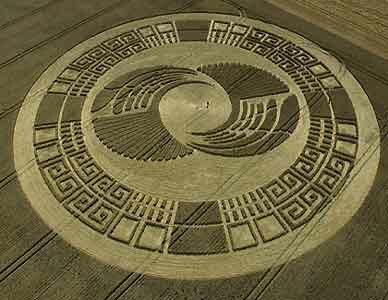 These geometric signs appeared in wheat, and corn fields were said to be coded messages from our space brothers that must be deciphered for our future references. Though many would not deny the fact that there are hoax circles, but it cannot be denied also that real circles can't be duplicated nor man can make perfect circles as these beings do." This formation was created in 2 stages - August 2nd and 3rd at Silbury Hill, Wiltshire, England. The design in its border is a mirror image of a rare statue of the Aztec God, Xochipilli, the Prince of Flowers, Maizes, Love, Games, Beauty, Song and Dance.